Alex and Stephanie are both teachers in San Francisco. For eight years they had owned and lived in a TICunit in Noe Valley. I’d spoken with them several times about refinancing their fractional TIC loan to lower their interest rate and payment. But each time they decided against it because they knew at some point they would convert their unit to a condominium, at which point they could refinance to a condominium loan. 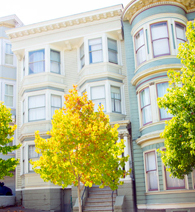 Their six unit building had lost the San Francisco condominium conversion lottery several times but with each loss, their chances of winning improved. After several years of losing, they finally won the lottery in 2012. They and their co-owners then embarked on a year and a half process to complete the work required by the city to convert to condominiums. When there conversion was complete, they contacted me for help refinancing to a condominium loan. They had been anxious to lock in an interest rate for several years. They had no plans to move and had always been wary of the adjustable-rate mortgage they had for their TIC. For their condo loan, they chose a 30 year fixed. Although their conversion was complete, they were still tied to their five co-owners until their refinance closed. Even though each unit had its own fractional TIC loan, the legal description for each unit (which appears in city records) still described each unit as an interest in a six unit building. In order to fix the legal description, all six refinances had to close concurrently. I worked with Alex and Stefanie and another owner in the same building to refinance to condominium loans. The other four loans were handled by different lenders. The lenders needed to coordinate with one another so each refinance would close at the same time. Trying to close six loans at one time can be a challenge given the different personalities, financial situations, and plans among the owners in the group. 45 days after beginning the process Alex and Stefanie’s loan closed along with their five co-owners. The last vestiges of their tenancy in common ownership had been cleared from public records. They owned a condominium with a 30 year fixed loan in place at an excellent rate. Thank you for helping us get a loan! We are very happy everything went so well.